Syllabus of the Online Course (Subject): Other Institutions and Anti-corruption Initiatives. Learning materials in or Iniciativas Anticorrupción Corruption. The European Council created in 1999 the Group of States of the European Council Convention against Corruption so that its Member States could better combat corruption, both nationally and internationally. 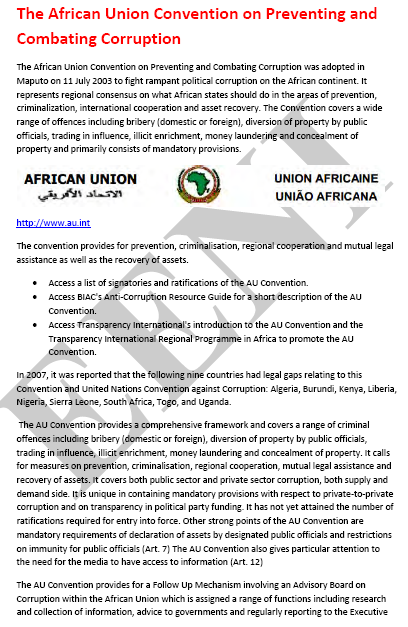 Criminal Law Convention against Corruption. The GRECO member countries are Albania, Andorra, Armenia, Austria, Azerbaijan, Belgium, Bosnia and Herzegovina, Bulgaria, Croatia, Cyprus, the Czech Republic, Denmark, Estonia, Finland, France, Georgia, Germany, Greece, Hungary, Iceland, Ireland, Italy, Latvia, Liechtenstein, Lithuania, Luxembourg, Malta, Moldova, Monaco, Montenegro, the Netherlands, Norway, Poland, Portugal, Romania, the Russian Federation, San Marino, Serbia, Slovakia, Slovenia, Spain, Sweden, Switzerland, former Yugoslav Republic of Macedonia, Turkey, Ukraine, and the United Kingdom. The Stolen Asset Recovery Initiative is a joint venture between the World Bank and the United Nations Office on Drugs and Crime; it was created to supports global efforts to wipe out the tax havens considered safe for corrupt funds. 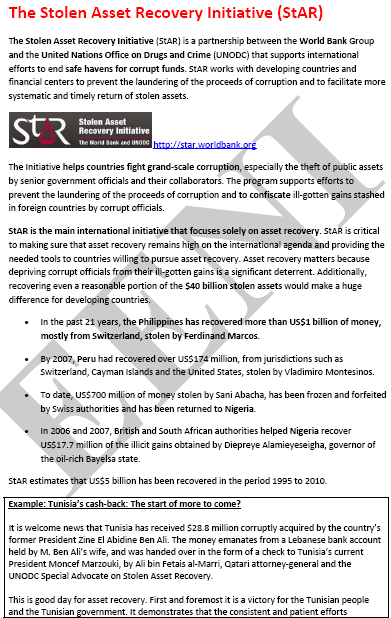 The Philippines has recovered more than one billion dollars, in particular from Switzerland, stolen by Ferdinand Marco. Peru had recovered over 174 million dollars stolen by Montesino. The World Bank estimates that cross-border flow of proceeds from criminal activities, corruption and tax evasion amounting to a total of between 1 and 1.6 trillion dollars a year. The Global Financial Integrity promotes policies, warranties, and agreements to curb the cross-border flow of illegal money, proposing solutions, facilitating Strategic Partnerships, and conducting groundbreaking research.